A new free exhibition has just started in Paris. It is called: ‘Art Liberté – du Mur de Berlin au Street Art’ and takes place in the Gare de l’Est which is the Parisian train station from which depart most of the trains towards Germany. The exhibition is focused on three different ways to discover the Berlin Wall, all three exhibited in and around the Gare de l’Est. 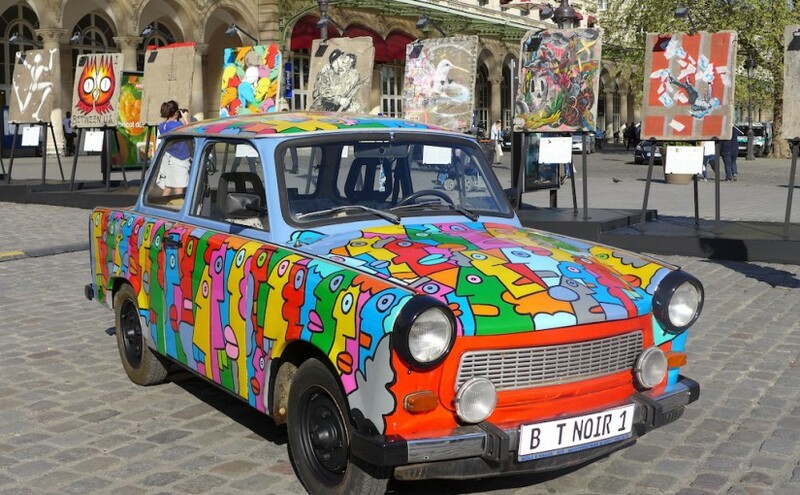 On the square in front of the station: 30 original pieces of the Berlin Wall and 3 Trabant (The mythical car of the GDR) have been painted especially for the exhibition by famous international street artists. Among those artists Thierry Noir is the first one to have painted on the ‘wall of shame’ in 1984… causing the growth of street art in Europe in the eighties. Inside the station: Pictures of the works painted on the Berlin Wall during the eighties are exhibited in the Hall d’Alsace where one can also see a movie called ‘Ephemère’ telling about the history of the Wall. In the rue d’Alsace, on the west side of the station: a mural painting which is 47 meters long has been made by the same street artists and will stand there for a couple of years and not only for the duration of the exhibition. Everything is colourful, free and really worth the visit! Until 8 July 2015 in the Gare de l’Est in Paris.